Home - Florida - I understand why I need to learn CPR but why should I learn how to use an AED? I understand why I need to learn CPR but why should I learn how to use an AED? 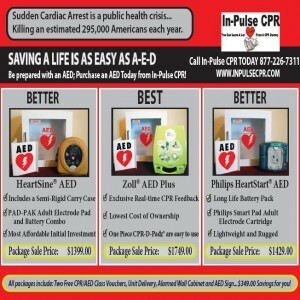 Category: Florida, Minnesota, Pennsylvania, Why do we need AED training? Many people understand the need to learn how to perform CPR but have trouble understanding why we also teach how to use an AED in all of our classes. An electric shock delivered quickly by an AED can be life saving. AEDs are becoming increasingly more popular at public venues including airports, sports areas, malls, office complexes, churches, and such the like because of their importance. Defibrillation within three minutes of Sudden Cardiac Arrest (SCA) increases the chances of survival by 70 percent. AED use within one minute of collapse raises the survival rate to 90 percent. You may be the only person close to SCA victim able to respond quickly. An AED (Automated External Defibrillator) is a device that delivers an electric shock to the heart of a person in cardiac arrest. An AED is easy to use and, in most cases, will walk you though step by step on how to use them. The AED is a “smart device” and will only deliver a shock when it is needed. Calling 911 is necessary but the wait for first responders may take too long. The average time to arrive in a typical community is nine minutes. When a person collapses in cardiac arrest the heart is often in a rhythm called ventricular fibrillation. This irregular rhythm is fatal unless an AED is applied. CPR must always follow the use of the AED, as the AED alone will not return the heart to a normal rhythm. The two go hand in hand. If an AED is not available, you should always call 911 first and then immediately start performing CPR. Performing CPR will buy time for the paramedics to arrive with their own equipment. If your company or organization owns an AED be sure the staff get the proper CPR and AED training. An AED should be used whenever you see a person collapse or become unconsciousness and who does not respond. It should also be used if you come upon a collapsed person even if you didn’t see that person collapse. OSHA now recommends AEDs in the workplace, and recent legislation may require your workplace to provide them. Speed is crucial. The AED must be attached as quickly as possible. Call 911, tell the operator you have an AED and then bring it to the collapsed person. Turn it on and follow verbal directions. Every minute of delay decreases the person’s chances of survival by 7% to10%. discounted price. Contact our office for details.